Carolmac Irish Terriers were started in 1965 in Bolton, Lancashire, UK. 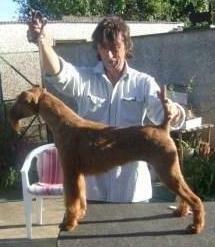 by Paddy Carroll when he purchased Swinpen Colleen from Tommy Evans. From one small purchase Paddy went on to establish a name for Carolmac in the ‘doggy world’ with successful breeding that continues to this day. Paddy now having re-located to his native south east of Ireland and accompanied by his son John, who prepares and handles the dogs, Carolmac Irish Terriers have gone from success to success. In the last five years we have produced nine Champions, eight of our own, two of which also gained their International Champion titles and a puppy sold to another kennel gained her Champion title last year. Nine Champions in five years is, we think an achievement to be proud of by anyones standards. 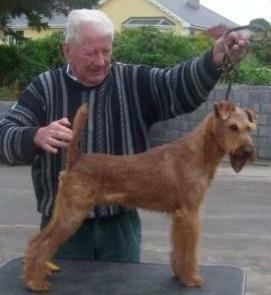 Both John and his wife Laura are active members and on the committee of the All Ireland Irish Terrier Club. Carolmac Irish Terriers have been exported to the United States of America, Argentina, Italy, Holland, Bermuda, Germany, Sweden and Lithuania, not to mention the UK and Ireland. Carolmac’s reputation for quality is second to none. In addition to showing and breeding, Carolmac also specialise in hand stripping terriers and offer a boarding facility, at competitive rates. Carolmac are located in the South East of Ireland, in a rural setting that enables the dogs to enjoy freedom and a natural habitat.